There was a time telemedicine meant holding a heart- rate monitor up to the phone receiver to play an audible signal. Modern telepresence robots like the RP- Vita from InTouch Health do more than put a patient’s diagnostic information in the hands of an offsite doctor, they create a virtual presence that allows physician and patient alike to have an experience startlingly close to the real thing (see figure 1). With sophisticated controls, advanced imaging, and small, quiet FAULHABER DC motors from MICROMO, InTouch brings top-flight medical care to the farthest reaches of the globe. The RP-Vita is the latest in a family of remote presence (RP) offerings from InTouch. In addition to its RP-Xpress, a hand-held unit for wireless consults; the company makes a pair of manual telepresence carts: the RP-Lite, for ER and ICU use; and the RP-Vantage, a surgical telepresence unit with a boom-mounted camera that can be positioned over a sterile field by a remote user. The RP-7i represents the company’s first foray into autonomous telepresence robots. When it came to designing its most recent system, the RP-Vita, InTouch sought to build an anthropomorphic version that can navigate to a pre-mapped position on demand or give the off-site operator full control over steering, as well as communications, visuals, and data. The RP-Vita consists of a 49-in.-tall “torso” topped by a display that acts as the head, both in form and function (see figure 2). The robot sports a suite of sensors from laser range finders to sonar that provides 3-D mapping of the facility with obstacle-avoidance capabilities. Multiple I/O channels enable two-way communication among doctor, patient, and staffers, while making it easy to interface with diagnostic equipment. Control can take place remotely via iPad or on site using an integrated touchscreen. Packing so much functionality into a relatively compact unit presented plenty of challenges. In addition to satisfying requirements like low audible noise and high efficiency for extended battery life, the system also had to meet stringent medical safety standards with strict limitations on radiated emission and electrical noise. 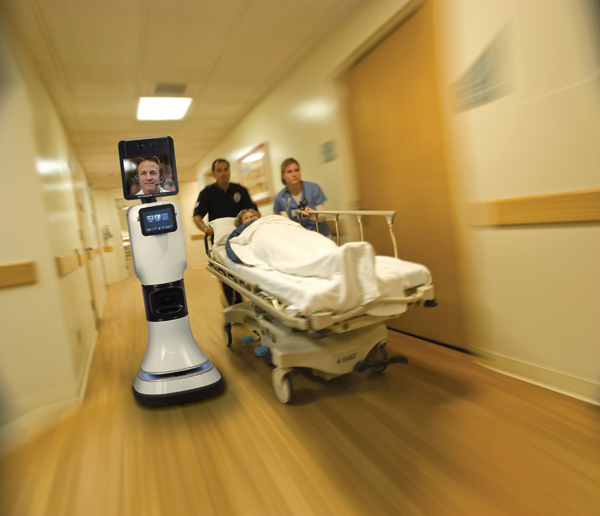 Unlike industrial robots, the RP-Vita moves within the hospital environment, traveling in and out of rooms, sometimes piloted by the off-site user and other times traveling autonomously. It needed to be nimble, reliable, and aesthetically appealing. Above all, though, it needed to be safe and reliable. “It might not be used all day long but when a stroke patient comes in and they need to interact with a specialist at a neighboring hospital, the robot needs to be online and fully functional,” says Daniel Sanchez, director of mechanical and electrical engineering at InTouch. A physician’s eyes and ears are essential to the diagnosis and treatment process. Like the other devices in the RP family, the RP-Vita integrates two high-definition cameras in its display. One camera features a fisheye lens for a 180° field of view; the other delivers greater than 20X optical zoom offering an overall 120X effective zoom capability between the two camera systems, allowing the off-site physician to do everything from navigate the hallways to zoom in on the eyes of a stroke patient. Of course, even the best camera in the world is worthless if it’s not pointing the correct direction. 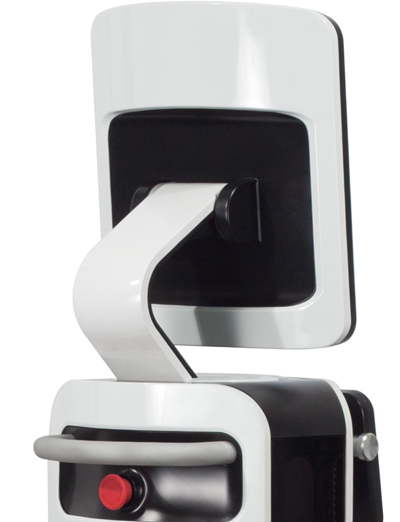 All of the InTouch mobile RP robots include high-resolution pan/tilt capabilities for their display. In the case of the RP-Vantage and the RP-Lite, the displays hang down from a cylindrical “neck” that is large enough to accommodate the components for both motion axes. The neck of the RP-Vita is entirely different in both shape and size, measuring just 4 in. wide by 1.5 in. thick (see figure 3). It wasn’t possible to fit the two sets of motors, gearboxes, encoders, couplings, etc. in that space. Instead, the team separated the motion axes, locating the pan components in the “shoulder” area at the top of the torso and the tilt elements where the display attaches to the neck. There was just one hitch with that approach: Now, the pan motor not only had to move the display but also the motion components for the tilt axis. The designers needed a tilt motor that minimized inertia while delivering sufficient muscle to scan the 5-lb display at 90 deg/s. The pan motor likewise had to be compact. Although the shoulder area of the torso would appear to afford plenty of room for a motion sub-assembly, in reality much of the space is occupied. On one side, a storage locker holds a headset and a stethoscope; on the other side, the recess hides a telephone to permit private conversation, as well as various audio and video input ports. It’s impossible to get accurate positioning without high- resolution feedback, of course. The question was what type to use. Because of the high reduction ratio, they needed a multi-turn encoder, but it had fit within a limited space. An incremental encoder could satisfy that requirement but it would need to be rehomed after every power interrupt. In the case of the RP-Vantage, for example, rehoming during surgery was simply not an option. The InTouch team developed an innovative hybrid solution that addressed both issues. To monitor absolute position, each axis of motion, includes a potentiometer that functions as an absolute position sensor. At the same time, each axis also has an incremental magnetic encoder to track displacement from some starting point, allowing the user to reposition the display as required. “The low-profile magnetic encoders are ideal for us because of their small form factor and high resolution,” says Sanchez. “That’s key for us.” An FPGA-based custom controls solution integrates information and performs path planning. In the event of a power interrupt and restart, the potentiometer gives the system knowledge of the absolute position of each axis within the range of motion, and closed loop feedback from the incremental encoder monitors repositioning. It was an effective design. When it came time to go to production, however, the team at InTouch faces the classic dilemma of an OEM: build or buy? In the case of InTouch, they choose to focus on their core value proposition of controls and communications and leave the motor subassembly to the motion vendor. Instead of assembling discrete components, they buy a motor with an integrated planetary gearhead. The sub-assembly from MICROMO also integrates the low-profile encoder and adds custom cabling. Every module that arrives has passed quality inspection and is ready for use. It’s an approach that works. InTouch currently has over 900 of its units in the field, and in every one of them, the pan/tilt systems have performed without fault. The motion subassemblies save them time and money in the assembly process and deliver the performance they need. Combining innovative design with a quality supplier has allowed InTouch to bring tomorrow’s medicine to outlying communities today. With MICROMO as a supply partner, InTouch can be sure of maintaining inventory throughout their product lifetime. The 2642, a 26-mm-diameter coreless DC motor that can be run up to 12 V and is capable of delivering 28 mNm of torque. The motor weighs just 114 g and can tolerate being back driven. The IE2, a low-profile magnetic encoder with a resolution of 512 lines per revolution. The 2642, a 26-mm-diamter coreless DC motor that can be run up to 24 V and is capable of delivering 28 mNm of torque. The motor weighs just 114 g and can tolerate being back driven. The The 26/1 S, a planetary gearhead offering a 14:1 reduction ratio.